I love music. Its’ colors remind me a lot of rainbows. We appreciate rainbows and we appreciate music, because both soothe the soul, inspire the mind and unlock the heart wide open. Its’ compositions and rhythms give way for inner peace to commence so that we can see the brighter side of life’s challenges. Bob Marley said it best in his classic masterpiece, “Sun Is Shining”. When the morning gathers the rainbow/ want you to know, I’m a rainbow too/ so to the rescue, here I am/ want you to know just if you can/ where I stand. I somehow find it appropriate to end the month of June with stating that rainbows are the sunbeams of life. In fact, we appreciate them so much that we are willing to endure the downpour that gives rise to them. In a recent online group poll, I presented the question of, “Why are obstacles our most valuable tools?” The majority of the members responded with great insight and a considerable amount of understanding. I was very pleased to hear that people are still willing to see their challenges as opportunities for growth, instead of barricades that get in their way. When we use our challenges as tools for growth, we are able to be wise for the goodness that life has to offer us. 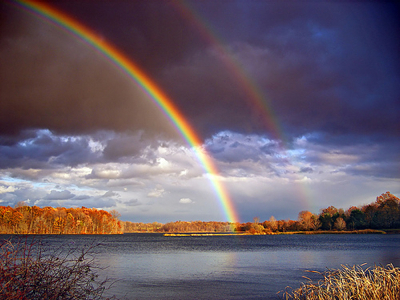 The rays of the rainbow signify colors of transition, healing, balance and contentment. Red stimulates vitality and ambition in us and increases our stamina; pink helps us to relax and be unselfish; orange has positive effects on our emotional state of mind and relieves lingering feelings of self-pity; yellow makes us more alert, decisive and increases our consciousness; while purple helps us to balance the mind and transform obsessions and rid of fears. I particularly love the color violet because it is rich in its own right – and it is associated with bringing peace, sensitivity and beauty to the soul. What do the colors in your life mean? Realize that without rain, there are no rainbows. Embrace the power of your NOW, then go outside and enjoy the benefits of the sun! Have a great forthcoming Independence Day! Love for your Tuesday and your month ahead.